Ryan and I ran this race last year [recap here in case you missed it the first time around], and as soon as he saw the BLING for it this year we KNEW we had to sign up. We will be there again, will you?! Awesome '80s Run San Diego November 2, 2013. Coolest Music, Entertainment and Costume Contest. 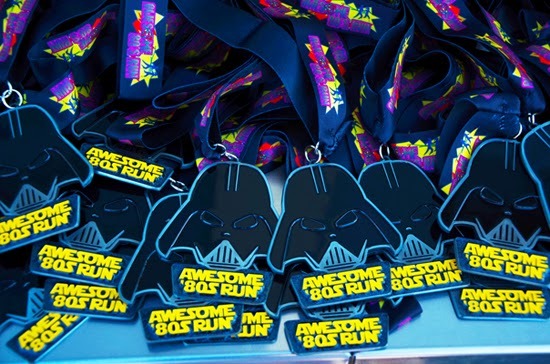 Custom '80s Medal and t-shirt for all finishers. Rad '80s photo props including a Back To The Future DeLorean. Perfect opportunity to dress up in your favorite '80s gear! -Neon shorts and leggings, wild colorful hairstyles, big glasses, headbands and scrunchies, stylish leotards, etc! Use code STARWARS to SAVE $5 off registration.